Haddington Island lies just offshore of Port McNeill. If you have ever taken the ferry to Malcolm Island or Cormorant Island you will have travelled past this historic location. 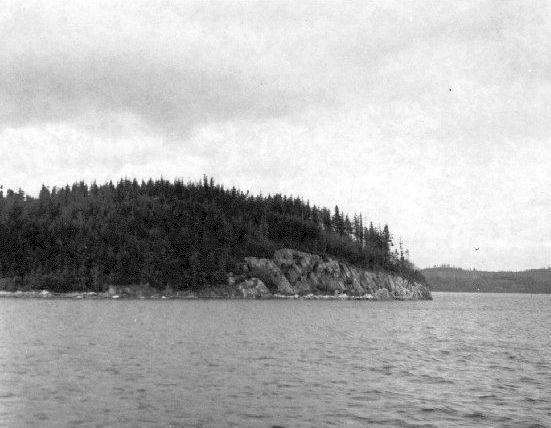 Haddington Island is within the traditional territory of the ‘Namgis First Nation. It is named after Thomas Hamilton (1780-1858), the ninth Earl of Haddington, who also served as the First Lord of the British Admiralty. The island is most well known for its quarry of andesite, similar to limestone. When the BC legislature buildings were being designed in the early 1890s, renown architect Francis Rattenbury selected the unique stone for its density and fine grain. The stone can hold intricate carving, but will withstand frost and harsh weather. It is noted to have a unique yellowish-grey appearance. The initial budget for the legislative buildings was $500,000, although the final costs exceeded $950,000. Challenges began almost immediately with the supply of the stone. During construction, the contractor responsible for procuring the Haddington Island stone, Fredrick Adams, struggled to keep up. At one point he and Rattenbury got into a shoving match, which ended in Adams being charged with assault, and fined $25. Pushed to meet production deadlines, Adams was drowned when shipwrecked in bad weather while maneuvering the barge used to tow the stone the 250 miles from Haddington Island to Victoria. The project was completed one year behind schedule, largely due to issues procuring materials. From 1895 to 1966, Haddington Island stone was a popular building material, and can still be seen in many buildings in downtown Vancouver. Tonnes of the material were also used in less glamorous projects such as the Ogden Point breakwater in Victoria. Men working in the Haddington Island quarry during the WWI era would have made between $3.00 and $4.25 for an eight hour shift. Granite was, and still is, extracted using a drilling and blasting method, which separates the stone in large blocks. One of the last major construction projects which used the stone in the mid 1900s was Vancouver City Hall. After that, architects moved to favour steel and glass as building materials. In 1966 the quarry was closed. In 1967 the brand new ferry, the Queen of Prince Rupert, ran aground in dense fog on Haddington Reef, while negotiating the Kelsey Bay – Prince Rupert run. The ferry was refit and returned to service. The Haddington Island stone quarry was reopened in 2004, and is once again producing andesite to be used in buildings and monuments around the Northwest. It has recently been used in the construction of the Air India monument in Stanley Park, hotels, and buildings at UBC and SFU. Like the Blog? Don't miss the next post. Have it emailed to you each month!